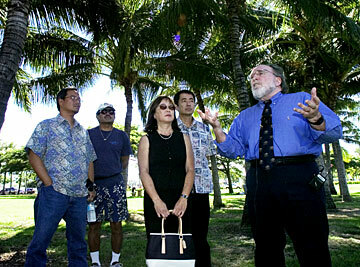 U.S. Rep. Neil Abercrombie held a news conference yesterday at Kakaako Waterfront Park regarding future use of the area, watched by Jason Sakai, left, Gary Akiona, Christine Kaneshiro and Dexter Okada. CONCERNED THAT the new plans for Kewalo Basin and Kakaako do not include a transit stop and not enough public input, U.S. Rep. Neil Abercrombie wants the state planning agency, the Hawaii Community Development Authority, scrapped. At a news conference yesterday at the gateway to the existing Kakaako park, Abercrombie, who opposed the creation of the HCDA nearly 30 years ago, called on the 2006 Legislature to repeal the laws creating the semiautonomous state planning agency. "This plan does not take into account our ordinary hard-working people of Hawaii," he said. "The best solution is for the Legislature to repeal the act that brought the HCDA into existence and put the authority back with the city." Abercrombie is now objecting to an HCDA plan to develop 36.5 acres of state land next to Kewalo Basin in Kakaako. The agency selected a plan by Alexander & Baldwin to construct restaurants, shops, an amphitheater and nearly 1,000 condominium units. Opponents are opposed to selling state land to build condos, and fear that public access to the park will be limited because of increased congestion. Most of the land, the last piece of undeveloped urban waterfront on Oahu, is now zoned for commercial or industrial use. The HCDA was created to handle all development of the Kakaako area to preserve light industrial use, build affordable housing for local residents and create parks, according to Abercrombie. "I think there is plenty of time to stand back and take a deep breath and decide whether we want the HCDA to continue to exist," he said. Daniel Dinell, HCDA executive director, said the agency was created to redevelop Kakaako, a former blue-collar community and light industrial area, which had been neglected. "We were to bring quality-of-life improvements. We have a long way to go, but we have a good track record of success," he said. "We have this overarching vision and plan for the district, and we have delivered on multiple fronts," Dinell said, adding the park land in the area has increased to 47 acres from 1.7 acres. Nearly 1,300 affordable housing units, including 1,000 rentals, have been built, and $200 million in street, sewer, drainage and utility improvements have been made under HCDA's authority, Dinell said. The HCDA is run by a 16-person board, with 11 responsible for Kakaako and the remaining five voting on plans for Kalaeloa, the other area under HCDA jurisdiction. The authority includes four state Cabinet officers and seven persons appointed by the governor. Of those seven, three come from a list from the City Council. Dinell said the public can appeal rules prepared by the HCDA and environmental assessments, but there is no way for the public to halt an HCDA project. "We are governed by state law, and we had input from two community groups," Dinell said. Community members at the Abercrombie news conference yesterday said they felt the HCDA public hearings were held after the authority had already agreed on the Kakaako plans. "The HCDA has a vision and a plan, but it is their vision, not ours," said Dexter Okada, a Kakaako businessman. "There has been no transparency in the process. We should have been involved," said Jason Sakai, with the Friends of Kewalo Basin.